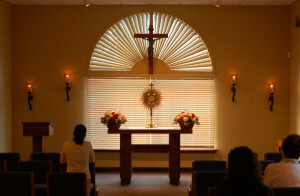 Our parish is dedicated to worshiping Christ present in the Blessed Sacrament. The Blessed Sacrament is exposed in the Chapel of the Angels every Monday, Wednesday and Friday from 7:30 a.m. until 9:00 p.m., with Night Prayer and Prayers for Vocations at the end. Two guardians are needed to be present each hour, and all are invited to come and adore Our Lord during these hours. Come and spend time in spiritual conversation, in silent adoration, and in heartfelt love before Christ truly present.